With the college basketball season officially past the midway point, which players, games and teams have been standouts? Let Seth Davis catch you up with his Five Minute Guide. We are now officially past the midway point of the 2016–17 college basketball season. We’ve set the table, we’ve taken stock, and now we need to do a quick reset. Therefore, your resident Hoop Thinker is on hand to produce my midseason Five Minute Guide. It’s everything you need to know about America’s greatest sport in easily digestible snack packs. 1. Josh Hart, senior guard, Villanova. The ultimate do-everything winner. Leads the Big East in scoring (19.3) while ranking fourth in rebounding (6.7), ninth in field goal percentage (52.8), fifth in assist-to-turnover ratio (2.03), seventh in assists (3.6) and 11th in free throw shooting (78.7). He also routinely guards the opponent’s best player. 2. Frank Mason III, senior guard, Kansas. Also his conference’s leading scorer (20.5) and ranks second in assists (5.5). He has drastically improved his three-point shooting (53.3%, up from 38.1 as a junior). If you could quantify intangibles, he would lead the country in toughness, leadership and determination. 3. Caleb Swanigan, sophomore forward, Purdue. The country’s leading rebounder (12.6) has proved to be a dynamic scorer as well. He ranks third in the Big Ten in points (18.2), 11th in field goal percentage (55.9) and 10th in free throw percentage (77.5). Has had four 20–20 games this season. 4. Lonzo Ball, freshman guard, UCLA. The ultimate difference-maker for a program that didn’t even make the NCAA tournament last year. Ball is second in the country in assists (8.0), he’s second in the Pac 12 in steals (1.84), and, despite his funky shooting form, he is drilling 43.0% from three. 5. Malik Monk, freshman guard, Kentucky. You could make a case that Monk is the second-most valuable player on his own team next to De’Aaron Fox, but he gets the nod here for his dynamic scoring (SEC-best 21.8 ppg, 41.5% three-point shooting) as well as the season’s most transcendent performance, a 47-point gem in the win over North Carolina. 1. Scott Drew, Baylor. Drew is having a well deserved moment after leading the Bears to their first-ever No. 1 ranking last week. 2. Mike Brey, Notre Dame. The Fighting Irish were not ranked in the preseason, yet they are No. 20 in the AP poll, and they’re undefeated in the ACC with three quality road wins. 3. Sean Miller, Arizona. Miller has had to deal with rampant injury and eligibility issues, yet the Wildcats remain very much in the hunt for a Pac-12 title. 4. Steve Alford, UCLA. Yes, the Bruins are excelling because of their freshmen class, but Alford is the one who recruited them, and it’s harder than most fans to realize to get hotshot young guns to gel with wily veterans. 5. Greg McDermott, Creighton. It’s not just about Dougie McBuckets this time. The Bluejays are winning big and scoring in bunches with a lineup that features three transfers and an emerging star in freshman center Justin Patton. 1. UCLA 97, Kentucky 92. It’s not easy to win in Rupp Arena, but this was a program-defining moment for the Bruins. 2. Kentucky 103, North Carolina 100. The best regular-season game college basketball has seen in a long, long time. 3. Nevada 105, New Mexico 104 (OT). The Wolfpack trailed by 25 points with 11 minutes to go in regulation and by 14 with 1:29 to play. Do you believe in miracles? 4. Baylor 66, Louisville 63. Baylor fell behind by 22 points in the first half but rallied to win in the championship game of the Battle 4 Atlantis. That triumph sent them on their way to the first No. 1 ranking in school history. 5. Minnesota 91, Purdue 82 (OT). It has been a rough couple of years for this program, both on and off the court, so this gritty road win against a quality league opponent yielded some badly-needed good vibrations. 1. St. John’s 93, Syracuse 60. The Orange have struggled often this season, no more than when they got walloped at home by a Red Storm team that had lost to Delaware State and LIU Brooklyn in the previous three weeks. 2. Fort Wayne 71, Indiana 68 (OT). This was just the fourth game of the season, and at the time it seemed like an odd blip. In retrospect, it was a sign of larger struggles to come for the Hoosiers. 3. Gardner-Webb 70, Nebraska 62. The Huskers went on to score some impressive road wins at Indiana and Maryland, but this one still stings. 4. UT-Arlington 65, Saint Mary’s 51. Yes, UTA is a solid team that could make some noise in March, but if the Gaels have designs on an at-large bid and a generous seed, then you can’t lose this game at home by 14 points. 5. Wagner 67, UConn 58. It may have only been the season opener, but it was a tone-setter. It also came before the Huskies were decimated by injuries to two of their top six players. 1. Baylor (16–1, 4–1 Big 12). The Bears lost their leading scorer, Taurean Prince, and one of the nation’s top rebounders, Rico Gathers. No one could have predicted they wouldn’t lose until Jan. 10. 2. UCLA (18–1, 5–1 Pac-12). The Bruins started the season No. 16 in the AP’s preseason poll. So we knew they’d be pretty good. We had no idea they’d be this dominant. 3. Florida State (16–2, 4–1 ACC). We’re used to seeing Leonard Hamilton’s teams defend with a passion, but this group can really score. 4. Notre Dame (16–2, 5–0 ACC). Perhaps we should stop being surprised when the Irish are nationally competitive, but their ability to replace NBA-caliber players in back-to-back years is truly impressive. 5. Butler (15–3, 4–2 Big East). The Bulldogs began the season unranked in both polls, but The Butler Way has prevailed once again. Winning cultures usually don’t go away. 1. Syracuse (11–7, 3–2 ACC). The Orange have rebounded lately with three wins in their last four games, but they still suffered that nasty drubbing at home to St. John’s. They also lost to Boston College on the road, to UConn at Madison Square Garden and to Georgetown in the Carrier Dome on the day they honored the late Pearl Washington. 2. Texas (7–10, 1–4 Big 12). The Longhorns were ranked No. 21 in the preseason but have fallen on hard times due to excessive youth, poor point guard play and off-court issues. 3. UConn (7–10, 2–3 AAC). As noted above, the Huskies have been hurt real bad by injuries, particularly the season-ending ACL injury to leading scorer Terry Larrier. But losing this often and by this much is still unacceptable. 4. Washington (8–9, 1–4 Pac-12). It is not easy replacing two freshmen whom no one expected to enter the NBA draft, but when you have a player as talented as freshman guard Markelle Fultz, you should be a lot more competitive than the Huskies have been thus far. 5. Michigan State (12–7, 4–2 Big Ten). I still believe in the Spartans, and the injury to freshman Miles Bridges that sidelined him for seven games didn’t help. But the home loss to Northeastern and the loss to Penn State in the Palestra have knocked the Spartans out of the rankings. 1. Maurice Watson Jr., senior guard, Creighton. The pint-sized transfer from Boston University is in his second year spear-heading this dynamic offense. He leads the nation in assists (8.8 per game) and has raised his three-point percentage from 29.7 as a junior to 48.4 this year. 2. Lonzo Ball, UCLA. He’s right behind Watson in the assist rankings. His ability to run the show has allowed senior guard Bryce Alford to move off the ball, which has made all the difference in Westwood. 3. Monte Morris, senior guard, Iowa State. Has fallen a little below the radar but still leads the country in assist-to-turnover ratio (5.81) and has the ability to explode as a scorer. Witness his 30-point performance in last week’s win at Oklahoma State. 4. De’Aaron Fox, freshman guard, Kentucky. Has incredible speed in the open court but still has an assist-to-turnover ratio of nearly three to one. 5. Nigel Williams-Goss, junior guard, Gonzaga. The transfer from Washington has fit nicely in Spokane. He’s a gifted table setter (4.9 assists per game, 2.24 assist-to-turnover ratio) who also leads the team in scoring at 15.2 ppg. "He paused in mid-air...and dunked it with his ears." 1. OG Anunoby, sophomore forward, Indiana. His posterizer over Maryland center Damonte Dodd was the most graceful dunk of the year. 2. Bam Adebayo, freshman forward, Kentucky. Great balance, big booty, explosiveness off the floor. Can really shake a stanchion. 3. 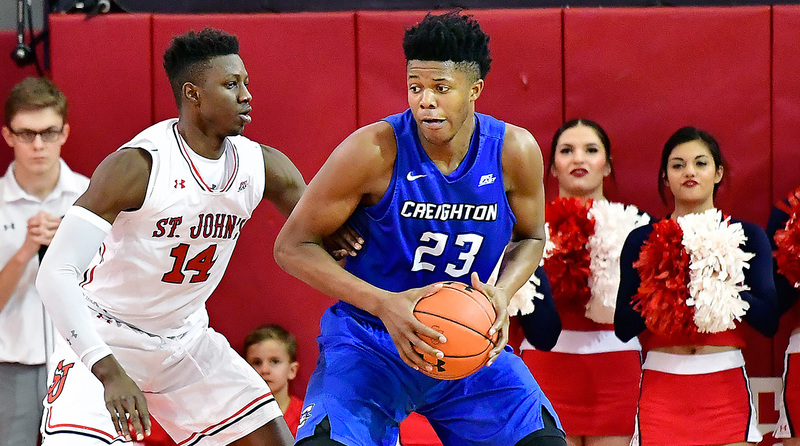 Justin Patton, freshman center, Creighton. Freshman center has had 46 dunks so far this season, 23 of which have come on lobs. 4. Miles Bridges, freshman forward, Michigan State. Freshman lefty glides for alley oops. 5. Chris Silva, sophomore forward, South Carolina. His one-handed catch-and-finish against Norfolk State in November was a great way to begin a stellar sophomore season. 1. Nathan Adrian, senior forward, West Virginia. Leads his team in rebounding (6.5) and is second in assists (3.3) and third in scoring (10.5 ppg). 2. Landen Lucas, senior forward, Kansas. Remains the team's only serviceable big man. Ranks sixth in the Big 12 in rebounds (7.6). 3. Mikal Bridges, sophomore guard, Villanova. His 58.5 field goal percentage indicates he could score plenty more than he does. A versatile defender who averages 4.8 rebounds, 2.3 assists and 1.6 steals. 4. Ishmail Wainright, senior guard, Baylor. Strong, athletic guard gets toughest perimeter assignment when the Bears are in man to man. Ranks second on the team in rebounds (5.3) and assists (3.6). 5. Anas Mahmoud, junior forward, Louisville. Great demeanor, solid rebounder (4.1) and inside finisher (61.2 field goal percentage). His ability to protect the rim (2.5 blocks per game) anchors the Cardinals’ defense. Like the rug in The Big Lebowski, he ties the room together. 1. Justin Patton, Creighton. Freshman center was lightly recruited out of high school and redshirted last season to get stronger. Now he’s averaging 14.0 ppg on 73.7% shooting for a Top 10 team. 2. Matt Farrell, junior guard, Notre Dame. Spent two years riding the pine behind Jerian Grant and Demetrius Jackson, but he was ready when his turn came. 3. Jock Landale, junior center, Saint Mary’s. The Gaels’ leading scorer is averaging 17.3 ppg on 63.0% shooting. Last year he averaged just under eight points per game. 4. Ethan Happ, sophomore forward, Wisconsin. His numbers are in line with what he did as a freshman, but he has been much more efficient and is in contention for Big Ten POY honors. 5. Eric Mika, sophomore forward, BYU. Big man took two years off for a Mormon mission before returning to average 20.5 points and 9.5 rebounds per game. 1. Alec Peters, senior forward, Valparaiso. Enjoying a stellar senior season, ranking second in the country in scoring (24.1), 12th nationally in rebounding (10.6) and 17th nationally in free throw shooting (90.6). He’s also 19th in the Horizon League in field goal percentage (45.4). 2. Tim Kempton, senior center, Lehigh. Well on his way to his third consecutive Patriot League POY award. Leads the conference in points (21.7) and rebounds (10.6), while ranking third in field goal percentage (57.1), third in blocks (1.12) and sixth in free throw percentage (78.5). 3. Semi Ojeleye, junior forward, SMU. He has been effective inside and out for a sneaky good team. He’s third in the AAC in points (17.7), ninth in rebounds (7.2), 11th free throw percentage (75.8), and 15th in field goal percentage (48.0). He’s also shooting 43.2% from three, good for fifth in the conference. 4. Dewayne Russell, senior guard, Grand Canyon. He stands 5' 11" and weighs 160 pounds soaking wet, but he is a scoring machine who hung 42 points on Louisville during a home loss in November. 5. Jaylen Adams, junior guard, St. Bonaventure. Has the nations third-best offensive rating among players who use at least 28% of their team’s possessions, per kenpom.com. Not quite torching the nets the way he did last year, but still clocking in a 22.3 ppg on 47.9% shooting (40.0% from three). 1. Middle Tennessee (15–3, 5–0 Conference USA). Returned core from group that upset Michigan State in the first round of the NCAA tournament, and added Arkansas transfer JaCorey Williams, who leads the team in scoring (17.9 ppg). 2. Illinois State (14–4, 6–0 MVC). The Redbirds knocked off Wichita State on Saturday to remain unbeaten in the Missouri Valley Conference. They also own home wins over New Mexico and Saint Joseph’s. 3. UNC Wilmington (17–2, 6–0 CAA). The Seahawks played Duke tough in the first round of last year’s NCAA tournament. They are the clear favorite to win the CAA this season. 4. Chattanooga (14–4, 5–1 Southern). The Mocs won a true road game at Tennessee in the season opener and nearly knocked off Vanderbilt in Nashville. 5. Nevada (15–3, 4–1 Mountain West). The class of a weakened Mountain West Conference. The Wolf Pack feature 6' 3" senior guard Marcus Marshall, the league’s leading scorer at 21.3 ppg. 1. Angel Delgado, junior forward, Seton Hall. 53.8%. 2. Nick Ward, freshman forward, Michigan State. 55.1%. 3. 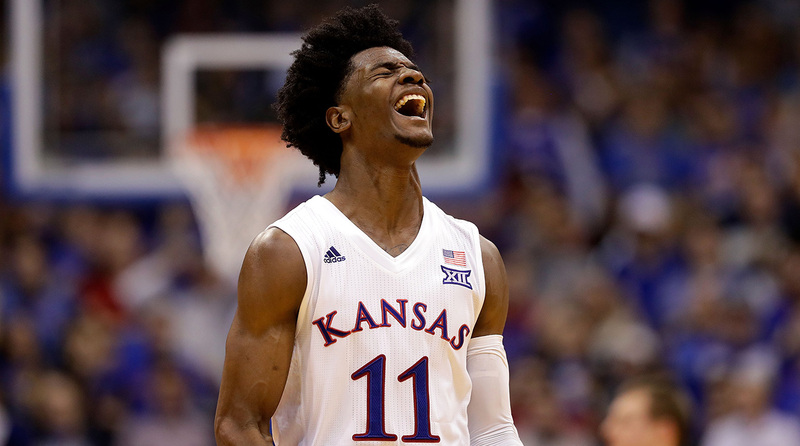 Josh Jackson, freshman guard, Kansas. 57.0%. 4. Jae’Sean Tate, junior forward, Ohio State. 59.7%. 5. Amile Jefferson, senior forward, Duke. 59.8%. 1. Kansas at Kentucky, Jan. 28. Just amazing that we will be treated to such a quality nonconference matchup in late January. Last year the Jayhawks won this game in an OT thriller in Allen Fieldhouse. 2. UCLA at Arizona, Feb. 25. This game could decide the Pac-12 regular-season title. 3. Gonzaga at Saint Mary’s, Feb. 11. Will likely be the last chance for someone to hand the Zags a regular-season loss. 4. North Carolina at Duke, Feb. 9. Besides being the game’s best rivalry, and one that always delivers, this game comes right after the Super Bowl and feels like the unofficial beginning of college basketball’s high season. 5. Creighton at Villanova, Feb. 25. Villanova won the first meeting in Omaha by 10 points. 1. What will Grayson do? Like it or not, this kid moves the needle far more than any other player in the game. The scrutiny on him will continue to be intense. 2. Will Gonzaga go undefeated? This part of the story will be fun. The second, wherein we debate whether the Zags deserve to be a No. 1 seed, will be as tiresome as it is inevitable. 3. Will Northwestern make the NCAA tournament? The Wildcats have never been in the field, but they are 15–4 (4–2 Big Ten) and looking very much like a tourney team. If only they had some alums working in sports media to chronicle this story closely. 4. Who will be national player of the year? The picture has already gotten increasingly muddled as the season has progressed. Nothing like a spirited debate to capture the public’s attention as the regular season winds down. 5. Will Villanova repeat? There have only been twos team in the last 44 years to pull this off, and the most recent was Florida in 2006–07. • I hope everyone saw the play that Notre Dame point guard Matt Farrell made Saturday night in the closing minutes at Virginia Tech. A Hokies player tried to roll the ball inbounds to save a few seconds, only Farrell dove to the floor, emerged with the ball and dished to a teammate for the clinching layup. Toughness, smarts, quickness, execution, all rolled into one. • It was kind of under the radar, but maybe the most significant result of the weekend was Georgetown’s comeback from 14 points down to beat UConn at home. The Hoyas have been struggling, to say the least. A loss at home to their former Big East rival, which has endured struggles of its own, could have been disastrous for morale. • Didn’t you just love seeing Indiana coach Tom Crean get after Devonte Green and Freddie McSwain attempted an alley-oop in the closing seconds of Sunday’s 19-point home win over Rutgers? I guess that’s what you’d call a teaching moment. • It’s not impossible that Amile Jefferson returns for Duke this week, but it’s not likely, either. The most realistic scenario has him coming back in two weeks, which should be about the same time Coach K returns from his back surgery as well. My understanding is that Mike Krzyzewski is very much in communication with his staff and involved in the practice and game planning. I know the Blue Devils have been struggling of late, but it would be pretty foolish to flush this team in mid-January. We’ve got a long way to go, and we have yet to see this group with all the pieces properly in place. • I get very frustrated when I’m watching a game and I don’t see a key play because the director has cut to a crowd/bench/hero shot. Please, directors, for the last time: Stay with the ball! • South Carolina is obviously better with senior guard Sindarius Thornwell in the fold, but sometimes I wonder if he and sophomore guard P.J. Dozier can co-exist to their fullest. Dozier looked terrific while Thornwell was out, but now I think he defers too much. • I sure hope for Texas’s sake that freshman forward Jarrett Allen isn’t considering turning pro after this season. Actually, I’m hoping that for Allen’s sake, too. He’s putting up some decent numbers, but he is not nearly ready, physically or mentally. That would be a tough thing for the program to recover from, though. It’s not easy to beat out the big boys for recruits of Allen’s caliber. • Tough loss for Utah at home to UCLA, but much respect to Utes coach Larry Krystkowiak for rocking the long-sleeved golf shirt look. Hope it becomes a thing. • Looks like Canyon Barry might have finally rediscovered his shooting touch. In his last four games, the Florida senior guard, who arrived as a graduate transfer from College of Charleston, is averaging 18.8 points on 11 for 20 three-point shooting. He had 27 points and seven rebounds in Saturday’s win over Georgia. This is already a really good defensive team. If Barry can continue to provide that kind of offensive punch off the bench, then the Gators are going next level. • Guess I was wrong about NC State getting ready to gain some steam. The Wolfpack lost at home to Georgia Tech on Sunday to fall to 1–4 in the ACC. • Temple lost at home over the weekend to Tulsa to fall to 1–5 in the AAC. The Owls are ranked No. 110 on kenpom.com. They also beat West Virginia on a neutral court in November. Because college basketball. • In case you’re wondering why Creighton was playing Truman State on Saturday, it’s because the Big East is doing a special league-wide slate of games in honor of Martin Luther King Jr. Day, and all the teams were required to play the previous weekend. Creighton didn’t have a game scheduled, so it played Division II Truman State because that school’s coach, Chris Foster, used to play for McDermott at Northern Iowa. • Who knew Truman was a state, by the way? • This is turning out to be a pretty disappointing season for Clemson. The Tigers were fortunate that Jaron Blossomgame came back instead of trying to enter the NBA draft, and yet they keep blowing opportunities to build a tourney résumé. They had a chance to knock off Virginia at home on Saturday but squandered it at the end. Now they’re 1–4 in the ACC with an impossibly tough hill to climb. • I think it’s very smart that the men’s basketball committee is having a metrics summit next week to move toward adopting a composite formula that will replace the RPI next year. But since the committee members have been using all those metrics for years anyway, the impact of the change won’t be nearly as great as many people assume. Committee chair Mark Hollis said over the weekend that he likes having the different metrics available to him because he can see where there are significant variances between the models. Once he spots them, he can dig into the numbers to figure out why. At the end of the day, these committee folks rely a lot more on the eye test than any numbers. They watch a ton of games, so they trust what they see. • Incidentally, the new metric idea is also an off-shoot of the ad hoc advisory panel that was assembled for the first time this past off-season in conjunction with the National Association of Basketball Coaches. The panel includes coaches from all levels of Division I, and big names like John Calipari, Bob Huggins and Mark Few have been taking part. That panel also supported the idea of having the No. 1 overall seed be given its choice of which region it wants to play in. Nobody is suggesting this process is anywhere close to broken, but it’s definitely a good idea to have a panel of coaches more involved in how things work. After all, they’re the ones who do most of the complaining. • Villanova doesn’t have too many weaknesses, but it’s hard not to be concerned about the Wildcats’ lack of a bona fide post player like they had last year with Daniel Ochefu. Imagine what might have been if their top recruit, 6' 9" power forward Omari Spellman, hadn’t ruled academically ineligible before the season started. •​ Gotta say I’m pretty shocked that Oklahoma State is 0–5 in the Big 12. I thought it was in for better things when it crushed Wichita State on the road by 17 points in December. • It’s going to be interesting to track UCLA’s defense. Right now the Bruins are ranked No. 96 in the country in defensive efficiency, per kenpom.com. They don’t have to great on D, they just have to be good enough. • Good to see Theo Pinson getting back into the groove for North Carolina. He had his best game Saturday since returning from the foot injury that sidelined him for the first 16 games. Pinson had 12 points, 10 rebounds and three assists in the win over Florida State. He is a valuable piece on what was already a very good team. • According to kenpom.com, Notre Dame leads the nation in free throw shooting percentage at 83.8%. Its opponents are shooting 76.0% from the line. For a time last week, Notre Dame opponents were No. 1 in opponent free throw shooting. That might be the most extraordinary stat I’ve ever seen. • Butler freshman guard Kamar Baldwin scored all of his 21 points in the second half of the Bulldogs’ win over Xavier on Saturday. That dude can ball. • Good to see Jordan Woodard return to the lineup for Oklahoma last week. He had 27 points, seven rebounds and three assists in Saturday’s win over Texas Tech. Not sure he can rescue the Sooners in time for them to get an NCAA bid, but it will be fun watching him try. • Portland scored nine points in the first half of its loss to Saint Mary’s on Thursday. That is not a typo. • I called the Michigan-Illinois game last week for Big Ten Network, and I noticed that Michigan’s stat sheet includes a separate page charting the team’s last five games. I thought that was brilliant. There may be other teams that do that, but I haven’t seen it before. • Finally, a pair of congratulations. First, to Miami coach Jim Larrañaga​, who notched his 600th career win on Saturday. Also, I want to tip my hat to the newest members of the Hall of Fame class for the U.S. Basketball Writers Association. They are: Frank Deford, the longtime Sports Illustrated legend; David Teel of the Daily Press in Hampton Roads, Va.; Steve Carp of the Las Vegas Review-Journal; and Tom Archdeacon, who has written for the Dayton Daily News since 1989. Xavier lost two straight on the road to Villanova and Butler. The Cintas Center should be hot and bothered, although I am concerned about Musketeers’ point guard Edmond Sumner, who has been playing with a bum shoulder the last two weeks. The Tar Heels played their best game of the season on Saturday against Florida State. I think it's a sign of better things to come. The Jayhawks have been flirting with defeat the last couple of weeks. They’re due to get clipped. Two of the best defenses in the country will lock horns in Columbia. 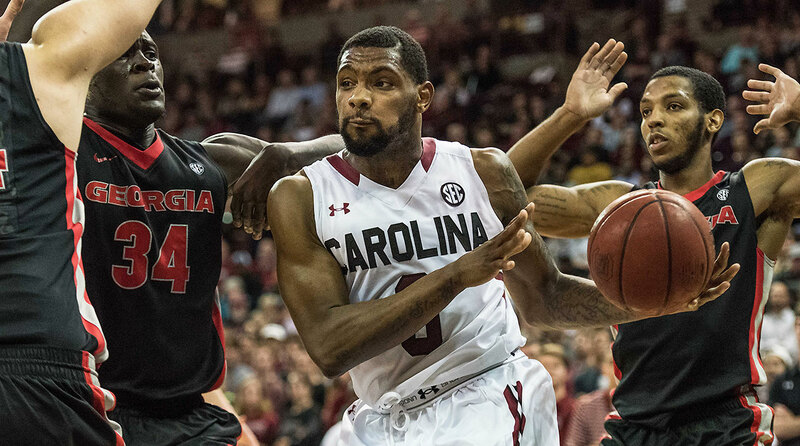 It's hard to pick against the Gamecocks with Sindarius Thornwell in the lineup, especially at home. The Irish have already logged road wins at Pitt, Miami and Virginia Tech, but this is a whole different matzo ball. Since I ranked Baylor No. 5 last week, the Bears’ loss at West Virginia did not particularly surprise me, nor did it have much effect on my ballot. I tend to follow the rule that a team stays at No. 1 until it loses, but Kansas does not look like the best team in America right now. Like I said, I suspect a few stumbles are in the offing. Notre Dame is my high riser this week. The Irish are definitely passing the eye test. They’re undefeated in the ACC and have won three tough games on the road. I don’t usually punish a team for losing to a quality opponent on the road, but I did feel compelled to move North Carolina at least ahead of Florida State. Duke is a tough team to evaluate right now because it is playing without Amile Jefferson and Mike Krzyzewski, and both are due to return in a couple of weeks. But there’s no doubt the Blue Devils have lost their swagger, and so their ranking had to reflect that somewhat. It was a shame to boot Minnesota from my ballot after just one appearance, but the Golden Gophers lost twice last week on the road to Michigan State and Penn State. Seton Hall’s losses at Marquette and Providence opened up a second spot. As you all know, I like to go fishing for a mid-major at the bottom of the ballot (an idea I stole from John Feinstein), which is why I put UNC Wilmington back at No. 25. I ranked the Seahawks there a few weeks ago but dropped them after they lost by 14 at Clemson. But they have only two losses and they are No. 43 on kenpom.com. We’ll see if they are ready for their close-up. My Almost Famous list includes SMU, which darn near won at Cincinnati on Thursday before losing by two; South Carolina, which has a huge week with games against Florida (home) and Kentucky (road); Illinois State, which caught my attention with that win over Wichita State; Indiana, which lost a tough one at Maryland last week and hosts Michigan State on Saturday; Middle Tennessee, which looks like it’s going to run away with the Conference USA title; and Iowa State, which has a huge opportunity on Monday when the Jayhawks come to town.